Buying Generics - Quality vs. Quantity, Value vs. WorthEliminate The Muda! There was a great post Save $100,000 with a Do It Yourself Taste Test over on the pages of WiseBread today by Elizabeth Sandberg. A woman after my own heart she took the time to run the numbers and found that the average family may save as much as $100,000 over the course of their lifetime by switching to store brands from name brands. Honestly, I’ve been a brand snob most of my life. My father taught us that quality was more important than quantity. For him, quality was more important than saving money. I was such a convert that I avoided opportunities to learn that you can find quality without having to spend the most money. After getting past my hard headed ways I have learned there is a difference between quality and value. Reading Elizabeth’s post made me begin thinking about the quality and what it really means. When you think about buying clothes, Macy’s has a wide selection of high priced clothes which we would associate with quality. Walmart also has a large selection of clothes that are priced more moderately. Does this mean the clothes from Walmart are lower quality, are they going to disintegrate upon their first wash? Does Macy’s sell quality and Walmart not? Of course not. There may be a difference in style. The thread count or weight of fabrics may be different. Technically we could differentiate the clothes based on “grade” of materials. Walmart has a lower grade than Macy’s, but both sell quality products. Both stores are so confident of their quality they offer return policies. Both a Toyota Corrolla and it’s sister car a Lexus HS are good quality cars, however, each offers differing levels of value. The value you get from clothing or cars will vary based on your needs, tastes and desires. Using Elizabeth’s example of Cocoa Puffs (her guilty pleasure, not mine) she found a “slight” difference between her name brand and the store brand Cocoa Comets. For her taste and infrequent purchases of this product the $.79 savings was not worth the buying the Comets. 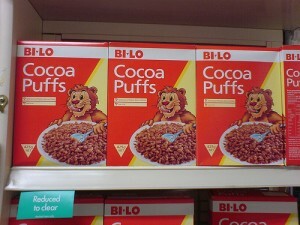 She see’s better value, based on taste, in the Cocoa Puffs. Elizabeth had the choice of giving up future financial gains for an indulgence today. We are always faced with these choices of determining value vs. worth or deciding on quality vs. quantity. In many cases the difference between these choices are negligible. Using a LeanLife approach, every time we decide to spend one more dollar for higher “quality” or better value that is one less dollar we have to save. The average person in the U.S. makes about $32,000 per year or a little over $15 per hour and saves, currently, about 4% of their earnings. Based on these rates, for every dollar that is actually saved for their future they must generate $25 in income, or conversely for every dollar that is spent it required $25 in earnings. With this perspective, considering how hard we all work for our money, it’s hard not to always side on the path of the generics especially when there is only a “slight difference” in taste. Assuming Elizabeth makes an average income, I wonder if she would still think the added value of a “slightly better” tasting Cocoa Puff is worth working an extra hour or so to afford the extra $.79? Please give me some feedback, click on comments link below and let me know if this makes you thing twice about your spending habits? Related Post: Don’t buy low cost, buy best cost.